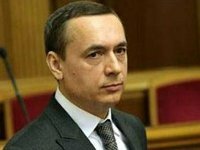 Verkhovna Rada of Ukraine has passed a draft decision on abdication of People's Front faction member Mykola Martynenko of his deputy powers. As a correspondent of Interfax-Ukraine said, 228 MPs voted for the decision initiated by Mr. Martynenko on Tuesday. However, the deputy was deprived of the mandate just from the third try. Now People's Front faction numbers 80 parliamentarians. Delivering a speech before the voting, Martynenko said: "I took up this decision since I don't want to allow destabilization through resignation of the pro-western parliament, early elections and revenge." According to him, over UAH 10 million was spent for the campaign to discredit him, administration organizers of this campaign to be known soon or late. As reported, Martynenko has announced he will give up his mandate in connection with a corruption-related scandal involving his name and a smear campaign against him. "My decision is to give up the people's deputy mandate and parliamentary immunity," he said during ICTV's Freedom of Speech TV program on Monday evening. He said that he would submit his resignation letter and would ask parliament to consider it at the next plenary week. He said he would do his best to collect as many votes as needed for the decision to be passed. He also said he had been conducting his own investigation and would find who was behind the campaign and would make the names public. On November 26, MP from the Petro Poroshenko Bloc and former investigative journalist Serhiy Leschenko published documents, which, as he claims, is evidence that Switzerland had contacted Ukrainian Prosecutor General Viktor Shokin regarding an investigation against Martynenko. Leschenko also demanded that Shokin initiate the procedure to strip Martynenko of parliamentary immunity. He said the documents revealed that Martynenko was charged with money laundering and taking bribes. "They highlight the entire theory that Bradcrest [Investments S.A.] concluded an agreement with Skoda that it would be paid commission for all contracts with Energoatom," Leschenko said. On the same day, Martynenko denied any accusations by the Swiss side and he said he would prove he was neither a shareholder nor owner of the offshore company mentioned in Leschenko's documents.